An ode to pull-ups would not be complete without a nod to Mr. P90x Pull-Up, Tony Horton. This video was captured by Beachbody coaches, Kristin and Pat Hain, before Tony’s Super Saturday event in Lincoln Nebraska in October of 2010. Tony cranks out 20 switch grip pull-up/chin ups (with a slight kipping swing)! Play + Exercise = Life Long Health. The Kipping Pull Up is a whole body move. Pull up purists may object to it as “cheating” versus a strict pull or chin up. It does involve a pelvic swing “Kip” up to the pull up bar and push away from the bar to continue momement. The two, Kipping and strict, compliment each other; much like the hundreds of push up varieties. It does take time to master, for me it’s taken several months. It’s fun though once you do get or Kip it! Back to CrossFit Lincoln twice a week now. Sure most workouts can be done at home, y, elsewhere. But nothing beats the hands on coaching and souvenirs! 2010 Year in Review and 2011 Goals. Challenges, opportunities, failure, success, valleys and mountaintops – I encountered a mix of those as well as everyone who reads this post (and like every year before). For the exercise side of my life, the opportunities and successes jump to the front of my mind. The change-up in exercise and nutrition was sustained and significant. What began as an experiment in P90x in October of 2009 to improve core strength (part-time effort of course) evolved into a full on embrace of a more rigorous strength/metabolic conditioning program in CrossFit. I’ve tried to record both efforts as accurately and faithfully as possible warts and all. There’s a couple of weeks to go to make one full year of CrossFit. As shared in the Proof positive of training change post, the results of the training shift have been dramatic. 12-14 year personal bests (PR’s) from 5 mile to marathons are the tangible results with improved strength, weight loss and decreased joint pain the unanticipated benefits. 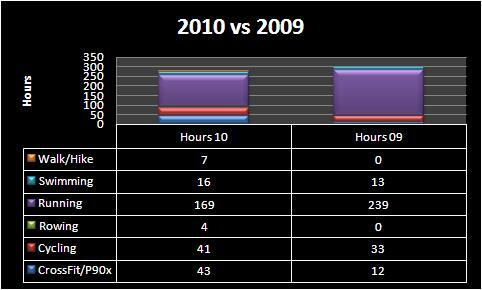 Comparing the data from 2009 to 2010 reveals a shift in running only dominance for both hours and miles. Overall miles were 2,002 in 2009 and 1,631 in 2010. The overall hours were close in 2010 and 2009 – in the 280 to 300 hour range or about 5 and 1/2 hours each week. What was accomplished in that time was more in 2010 for less time because of a higher intensity level for each training session and variety. Intensity – Since I run less and focus on speed/strength/stamina rather than sheer “miles”, I can do so at a faster pace. Speed builds on speed. In 2009 my average training pace per mile was a little over 10 minutes. Last year it was in the upper 8 minute range with workouts in upper 7 minute to low 8 minute range. Equally important, improving my stride technique – from heel to toe to midfoot / Pose strike introduces much less stress on my body. An added bonus was discarding my orthodics in June. Variety – the following chart, based on total number of workouts, shows the variety of workouts. It also is another slice on how time is spent. In 2009 81% of exercise hours were devoted to running, in 2010 it was 60%. 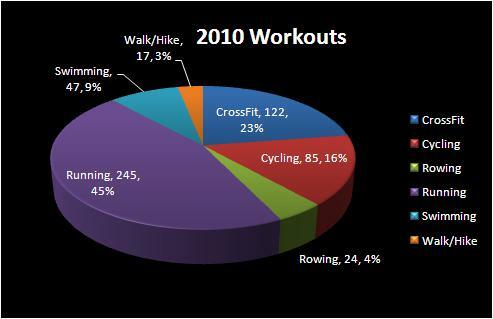 Total number of workouts were over 80% running, in 2010 that dropped to only 45%. The variety and introduction of rigorous strength training has left me injury free, healthier and instill a sense of excitement – never the same dull workout! Workout distribution - variety is fun! Keeping my goals simple this year. My 2010 goals were exhaustive . Continue workout mix of end of 2010(number and hours) – 40% run, 20% CrossFit WOD, 15% bike, 15% swim, 10% row to reach 1,500 to 1,700 miles in 2011. Continue growth of Freaky Fast crew! Nurture, nudge, hug em! Run 2-3 marathons with focus on sub 4 hour, work to 3:30. Continue PR trend for sub 22 5k, sub 37 – 5 mile, sub 46 – 10k and sub 80 minute 10 mile. Complete half iron man and Olympic triathlons. Attain CrossFit bests/competencies: kipping pull up, muscle up, WOD’s scaled at 80% instead of 50 to 70%, wall balls with 20lbs, 75 push and situps in 2 minutes, body weight bench x 20, etc. Improve cycling and swim technique: flip turns (swim that is) and acceleration (bike). Compete in 1-2 open water swims and cycling competition. Explore kayaking and wall climbing. Train to the season – was fun this year to have high weeks in running (March and late October), biking (July), swimming (late July and late December). I like training year round – sometimes it’s better to train to the season and swim inside than slip on ice! Nutrition – continue to explore and apply Paleo! Weight – maintain weight of 160lbs. Was at 180lbs in May of 2008 before Lincoln Marathon. No desire to lose more, do want to cut another inch or two off waist to get to 30″ (currently 31.5 waist, was 34.5″ in 2008). Be thoroughly shredded by year’s end! If you’re an aerobic athlete (runner, swimmer, cyclist, triathlete) who’s reached a plateau, has found more miles does not translate into success and wonders if strength training might help – please read. I’m not offering a quick fix, food gimmick, shake, or simple trick. Over the last year I’ve ventured into a different way of getting to a goal – it may not be for everyone. But I have found an incredible payoff from it and embrace it. Chart your progress over 12 months and see what happens! Proof. Data. Trends. Statistics and data gathering can mislead and interpretation of results requires wisdom as well as raw analytic power. That clarification and limitation declared, I do think there’s enough evidence that a combination of Strength Training + Aerobic Training is far more powerful than Aerobic Training alone. Modify that aerobic training to focus on stamina, speed, flexibility and burst, and alongside the strength training, your results will be strong. Hone that further with improved nutrition and those strong results become powerful. Two years ago, during one of my worst marathon experiences (4:52 at Twin Cities), I thought about punting it. Pack it up. Give it up. It was miserable weather day, but I had endured worse. It seemed though a goal of getting to Boston (or 1 hour and 22 minutes faster) was an impossible hope. Rather than give up I decided to push it harder. So in 2009 I ramped up the training. I knocked off a Pikes Peak Double and some “ok” marathon times (4:30 range). The price of that ramp up was high: a strained, torn sartorius tendon. 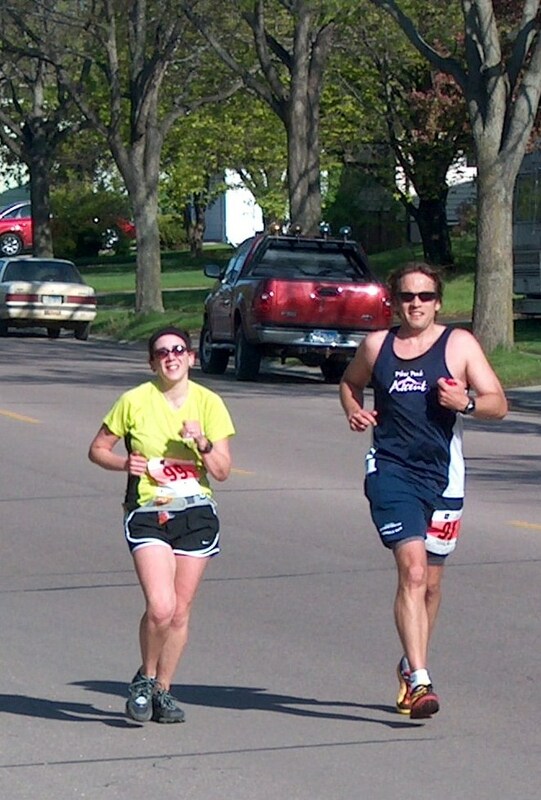 By October of 2009 I was hobbling at the start of the Des Moines Marathon. Sure, lots of miles in the bank, toward 1,500 running for 2009. But hobbling still. That began my entry into cross training – had done that in triathlon terms for several years. But serious cross training, or more properly strength training, nope, nada, avoided it. P90x was Stage 1. It was perfect for torturing my aerobically fed and strength dead body into shape. All the Tony Horton’isms, pull ups, sneaky lunges, gut cracking ab routines, yoga twisting/humbling sessions and push ups a guy could hope for. I saw some nice results. A chance encounter with a surly but dedicated athletic trainer, Mike Livergood, at Bellevue University in January of 2010 led to Stage 2 – CrossFit and CrossFit Endurance. Similar in many regards, the difference between the Beachbody DVD fed programming and organic CrossFit approach was significant. CrossFit is a better fit for my performance goals. Step by step, coaching from a great box and set of trainers at the Lincoln CrossFit box (Cole, Jeremy, Kelsey Phil and Tanya) and staying with it on my own have led to the best fitness base in my adult life. Stage 3 involved extending a wonderful speed group of like minded, er like age, friends to a group of Freaky Fast Runners I had no business trying to chase. From June until present, this group has been an evolving network of fast people who have fun. Not quite the same every time, but always putting the hammer down for speed, hills or a Saturday run. Love you all! So what does this mean? Big deal? I’ve been blessed to achieve 15 year PR’s in 5 mile, 15k and marathon races. This has been my best year of racing since 1996-98. There’s been some learning curve and minor injuries: a hamstring pull in late May from performing too many deadlifts a day before a 5 mile race and calf pull in July as my body adapted to move towards a “pose” esque running style, lots of hills, etc. From beginning to end – I’ve been pleasantly surprised or more apropos, shocked! While a 3 hour 30 minute marathon for Boston or a Full Ironman triathlon are not a sure thing, I can at least place those in the realm of possibility. I’ve been able to shave 24 minutes off my aerobicly training injected marathons of 2009, and now have only 37 minutes to go. The table below lists the results for marathons. I’ve also cut 15lbs, from 176 to 161, increased muscle strength and burst across a variety of tests. My “vitamin I” (ibuprofen) fix has been cut dramatically (not pounding the body and actually strengthening muscles, ligaments and connective tissue). I am to do things I didn’t image possible – a kipping pull up, jumping up with confidence to a 8′ pull up bar height, over 250lbs for deadlift, 40 unbroken knees to elbows. This still a ton of other goals to still drive me; for example, why not try to attain the Navy Seal standard for 40-50 age males? 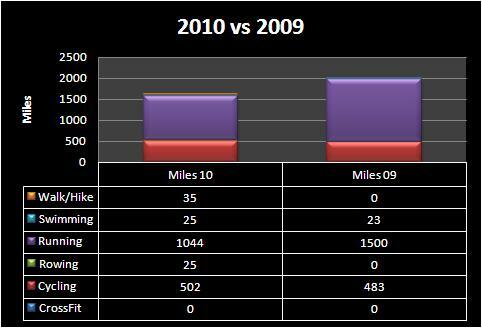 In 2010 I will run 66% the amount of running miles compared to 2009 (1,000 to 1,500) with the same biking and swim miles. Total aerobic miles will nudge 1,550 to 1,600 versus 2,000 in 2010. New aerobic miles have been introduced through rowing. In 2010 that 66% running miles will have been done at much more efficient and faster pace. In 2010 my anaerobic training (CrossFit) will reach 140 Workouts Of the Day (WODs), not including the aerobic oriented WOD’s. Overall training hours will be the same as 2009. Marathon OK 11/21/2010 422/1648 25.61% 9:27 4:07:55 P.R. September and October have proven to be a nice fusion of Triathlon (primarily running) and CrossFit, much like late Summer races into early Fall. Get your freak on fast! I’ve been blessed to notch two 14 year PR’s at a September 5 mile hilly run (Buffalo Run on Sept 12 – 38:31) and 15k October 17th run (Governor’s Cup 15k at 1:13:40). I hope those events bode well for my Tulsa marathon. I also enjoyed my most effortless 20 mile training run since the mid 1990’s – on Oct 30th. I was able to hold a steady 9:46 pace without gels and just with water. The running results have been inspired by a great bunch of Freaky Fast runners – well over 15 people have come together off and on the last several months to challenge, encourage and motivate each other (the pic includes some of ’em)! It has not all been cold skim milk and peanut butter cups though. I’ve had far to much allergy junk since mid October with a nice lingering smoker’s cough. Fortunately three bouts of stomach flu have not returned for round four. Buffalo – 14 year PR – 38:31! 5 Weekly stats + a Sunday – Day 148 to 184. Drats – another multi-week catch up. Am just including highlights below and will get back into the full swing of things from August on. Also am changing up weeks to a Monday to Sunday format – this fits with the Daily Miles tracking. I used to be far more obssessed about weekly mileage totals – especially for running. I’ve modified and mellowed a bit. I try to attain three simple goals now. 3 hard running workouts each week (generally aligned with CrossFit Endurance and broken into speed, hills/threshold and longer medium pace), recovery run and 1 to 2 bike or swim sessions each week. 5 to 6 hours of exercise each week done at a high intensity of anaerobic and aerobic burst (so heart rate above 145). Highlights over last five weeks. Mixing in each week a speed workout (Monday nights) and hill/threshold run. The group is growing by leaps, bounds and sometimes limps! Give and you’re given back to. Had hit a lull after June racing, time each week was going down and speed seemed to evaporate. Then Michelle encouraged running with Ashley Kumlien’s MS Run Across America. That and inspiration from Prefontaine snapped me out of a slump (July 1). Also led to meeting new running peeps who keep on adding on! My CrossFit Fran, Murph and Angie’s are improving, both in time, form and closeness to the “rq’d”. Hit a nice 5k time trail with Rachael in mid July – was very encouraging. Can hiking through hills/woods in the heat of day qualify as workout? Absolutely and did it with my son Joshua at Webelos Camp. Exercise time is going up! And will need that for the Pike’s Peak Ascent on August 21st! 4 weeks of racing and catching up on logs! Details are below. Here are three lessons I think I’ve learned well over the last four weeks that included a 5 mile race (better than last year), 10k race (2 minutes slower than last year), 1 Sprint Triathlon (impromptu change due to weather), 1 Duathlon (impromptu change due to weather), 750 meter open water swim and 5k race. Bucko, mucho, “lotof” racing is fun, but can leave rest of the week at risk. Still this year was unusual with the Hy-Vee triathlon moved up 2 weeks and Cornhusker State Games moved up a move for Special Olympics (very worthy cause and reason). 6 races in 4 weeks can be a bit of a mental drain. My happy place for CrossFit is 3 WOD’s per week. Still debating the full embrace of CrossFit Endurance. I agree wholly with the 4 day running, cross training and when you do train, train hard! I may not be at the point though to pull off the intensity week-end and week out. I do think I need to ramp up mileage just a bit and carefully manage distribution of “aerobic” miles – across swim/run/bike. Also am sowing long runs back into the equation. Sunday, Day 120 (5/23) – Bike ride on Specialized Hybrid – 11.5 miles holding around 12 mph. Seat mount broke so last 3 miles were off saddle, sort of. Monday, Day 121 (5/24) – East High Track – baseline mile. 1/2 mile warm up and then a 6.43 mile. Gunned first 400 too fast – 81 seconds. Felt good though. 6 seconds faster than April’s baseline mile. Right after Rachael’s Lincoln Jets track and in between Joshua’s Jr. Salt Dog’s game – life as a busy parent – squeeze those workouts when you can! Tuesday, Day 122 (5/25) – Timed mile swim at the YMCA – 41.01 for the mile. OK, getting slightly faster – miles last year were in the 44 to 46 minute range. Would like to get to 36 minutes in practice this year. Wednesday, Day 123 (5/26)– CrossFit morning – rowing, Shoulder WOD from 5/25) and 400 Meter Walking Lunge. The walking lunge blasted my glutes for a good 4 days =]! Then a little barefoot running with Heidi and .62 miles @ Doris Bair before Annaliese’s softball game (gee busy parent gig again, but worth it!) CrossFit Lincoln WOD Part 1: from Tuesday – wu – 400 m row, 25 situps, 10 samson stretch, 10 rock climb, 10 walking lunge, 20 squats, 10 kb 1 pu, Shoulder Press 10 wu 65lb then (1 – 75, 1 85, 1 95, 1-100, 1 -105): 1,110 total, Push Press (3 -75,3-85,3-95,3-105,3-115 — 1,275 total) and Split Jerk (5-75,5-85,5-105,5-115,5-125 – 1,925 total ). 4,310 lbs total load. Part 2: Wed WOD – 400 meter walking lunge in 14.42 (that was tougher than I’d thought it be, great Pikes Peak trainer). CrossFit WOD – warmup 400 mt row, 20 situp, 20 squat, 10 shoulder pass through, 10 pull up. Cashin 2 rds of 5 ring pull up, 10 jump muscle up, 10 ring dip, 5 chinup chest to bar. 50 pushups. Then main event AMRAP in 20 min of 15 ghd/ reg sirup, 30 jump rope su, 15 back extension. 9 rds + 30 jump rope and 9 ghd sirups. So total was 144 sit-up / ghd, 210 jump rope and 135 back ext . Still stinging a bit from walking lunge yesterday. 4 miles of hills @ Pioneer’s Park – temp’s were rising and quads/ glutes were rebelling! Slower upper 10 minute pace and crawl! CrossFit “WOD” – Linda. The key lesson learned, no Olympic lifting within 3 days of race! Ego got ahead of strength and punch through some nice weight loads. That felt good – but downside was weaken state going into Boystown race on Memorial Day. CrossFit Lincoln #WOD Linda (10,9,8,7,6,5,4,3,2,1). 175 deadlift (185 on 1st 5) 9,625lbs , 145 bench (155 on 1st 5) 7,975lb, 95 clean – 5,225. 41.07 time (17.52 longer). 22,825 total – 7,700lbs more. Compared to 2/18 after Spinning. 10,9,8,7,6,5,4,3,2,1 – 23:15 but lighter load (15,125lbs total): 115 bench, 65 clean & 95 deadlift. Sunday, Day 127 (5/30) – Exercise bike at the Cooper Y – kids were swimming and had a 1/2 hour. Leg’s feeling ok, but not great. Glutes still sore. 5.75 miles in 30 minutes. Monday, Day 128 (5/31) – Boystown 5 mile – 40.27. Another comparison to 2009 training – finished 42 seconds faster than last year. A bit of hammy tweak at 3.5 mi. 7.36, 7.44, 8.08, 8.48, 7.57. After the race 2.6 miles of walking at Henry Doorly Zoo for a birthday celebration for Annaliese. Tuesday, Day 129 (6/1) – Walking/ hobbling with Heidi. Right hamstring, left glute/ groin were very sore. Friday, Day 132 (6/4) – 2 mile easy run, needed to test legs to see if Havelock still a go. Saturday, Day 133 (6/5) – Havelock 10k – only race in 2010 that was slower than year previous, rats! Hamstrings and glutes sore / stiff until mile 4. Seemed like I was stuck in 3rd gear until 4.5 then was able to hit race pace from then on it. 8.04, 8.08, 9.13 (up “the hill”), 8.16, 8.40, 7.54, 1.38. 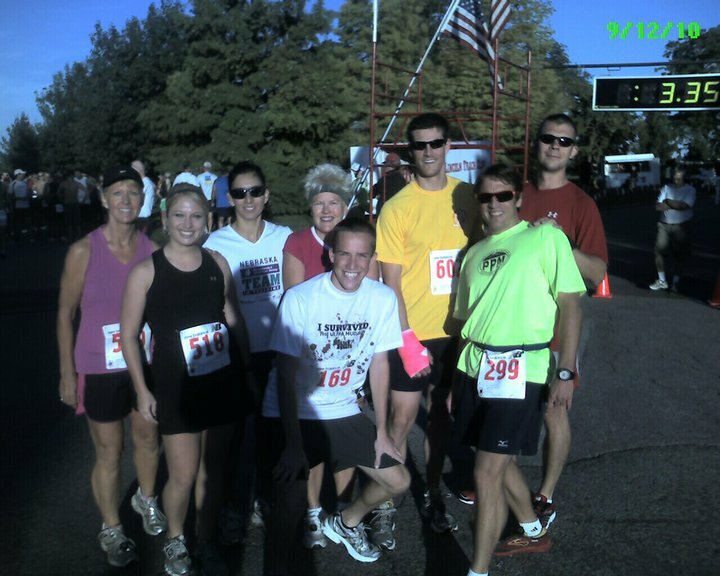 Bob’s Tavern team did great – Juan was under 50, Sherri and Andi ran strong 50’s and Anelle snagged her 1st 10k in the 60’s!!! PJ rocked the 3k and got 23 th! Sunday, Day 134 (6/6) – Exercise bike at the Cooper Y – kids were swimming and had a 1/2 hour. Leg’s feeling ok, but not great. Glutes still sore. 5.75 miles in 30 minutes. Monday, Day 135 (6/7) – Boystown 5 mile – 40.27. Another comparison to 2009 training – finished 42 seconds faster than last year. A bit of hammy tweak at 3.5 mi. 7.36, 7.44, 8.08, 8.48, 7.57. After the race 2.6 miles of walking at Henry Doorly Zoo for a birthday celebration for Annaliese. Tuesday, Day 136 (6/8) – Walking/ hobbling with Heidi. Right hamstring, left glute/ groin were very sore. Friday, Day 139 (6/11) – 2 mile easy run, needed to test legs to see if Havelock still a go. Saturday, Day 140 (6/12) – Havelock 10k – only race in 2010 that was slower than year previous, rats! Hamstrings and glutes sore / stiff until mile 4. Seemed like I was stuck in 3rd gear until 4.5 then was able to hit race pace from then on it. 8.04, 8.08, 9.13 (up “the hill”), 8.16, 8.40, 7.54, 1.38. Bob’s Tavern team did great – Juan was under 50, Sherri and Andi ran strong 50’s and Anelle snagged her 1st 10k in the 60’s!!! PJ rocked the 3k and got 23th! Monday, Day 142 (6/14) – CFE WOD Danny. AMRAP 30 20″ box jump, 20 push press at 65, 30 pull ups w band. 2 RSS plus box and push press. Good seeing Phil and lunch gang at CF Lincoln. Friday, Day 146 (6/18) – 2.1 miles running -with Heidi and Cash – a little later in the morning, was reaching up to 90 degrees. Wanted to loosen legs up before weekend of racing! Sunday, Day 134 (6/6) – 1 mile walking w/ some lunges. Active recovery day. Monday, Day 135 (6/7) – A bit of three workouts – one testing a real road bike! 1.5 mile bike test on at Bike Rack. Tuesday, Day 136 (6/8) – Warmup: 10 push ups, 10 KTE, Samson Stretch, Quad Stretch, 400 Meter Row. Buy-in:Tabata mashup: 8 rounds alternating between exercises 20 seconds of work 10 seconds of rest of: L-holds & Pushups (55) #WOD: For time: 13.10 – Run 800 meters, 30 back extensions, 30 ghd sit-ups, 30 back extensions, 30 knees to elbows, 30 back extensions, 30 abmat sit-ups. Cash-out: 10 Burpee pull-ups. Ran a bit more at home with Heidi for an even mile. Wednesday, Day 137 (6/9)– Swim and Bike – 300 yard swim at Uni over break and little over 11 miles bike riding on new Trek! Held 14.5 mph on new Trek looping around Mahoney, much smoother ride but clip shoes still take some practice (always fun to fall). Thursday, Day 138 (6/10) – 5k run with dogs to Mahoney (31 minutes) with 50 squat warm up before, then 3 x 2 minute trials – 51 push ups in 2 min, 25 strict pull/chin ups and 71 walking lunges after. Friday, Day 139 (6/11) – 7.66 Bike – 1.6 with Heidi and then loops around Mahoney – a little slower 11.7 mph.